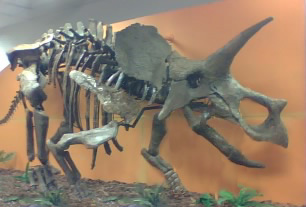 Cheryll and Henry are two Triceratops skeletons recovered from the Upper Hell Creek Formation, less than a million years before the K-T asteroid impact that arguably caused the extinction of the world’s dinosaurs. 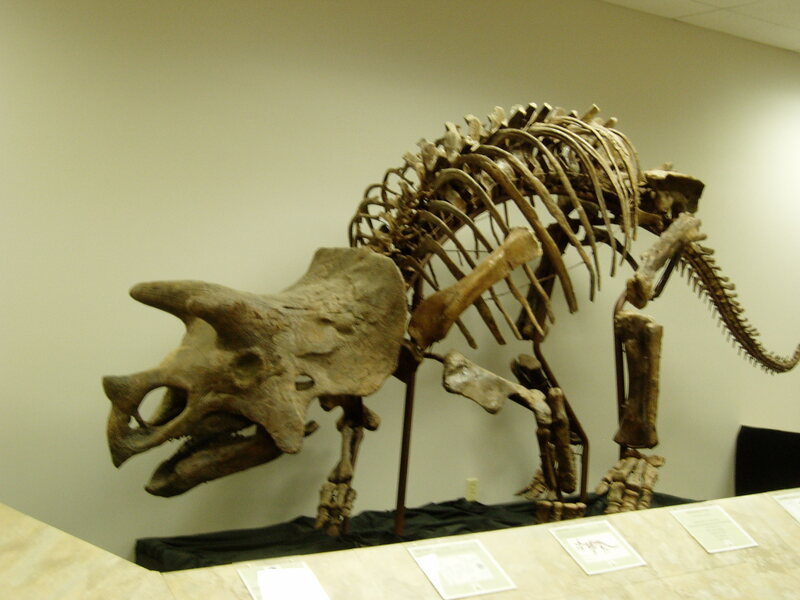 Cheryll, named after the wife of landowner Sam Marty, is a 20-foot-long adult Triceratops that died on the floodplain of a large river. Henry, named after famed paleontologist Henry Fairfield Osborn, was only half grown when he died. Henry is only 14 feet in length and died less than 8 miles from Cheryll. Birds were certainly rarer than dinosaurs in the Late Cretaceous and the discovery of fossil bird bones is always amazing. Thus far, the bones of at least three species of birds have been discovered at the South Dakota field stations. One bird, the most complete, most articulated Late Cretaceous bird from North America, represents what could be a new family of highly advanced Cretaceous bird. See Publications. Pterosaurs, flying reptiles resembling giant bats, were common during the rein of the dinosaurs but pterosaur remains are exceedingly rare in the Hell Creek Formation. Of the handful of pterosaur remains thus far recovered from the Hell Creek Formation, our specimens comprise about half of the reported specimens. A unique set of duckbilled dinosaur bones holds clues that Tyrannosaurus rex, contrary to some theories, was not a scavenger. The bones, which were damaged during life and fused together while healing, revealed a startling clue: a Tyrannosaurus rex tooth embedded within! Because the bone had re-grown around the tooth as it healed, the Tyrannosaur attack occurred while the prey animal was still alive. Remarkably, the duckbilled dinosaur survived the attack and fully healed before dying years later. Unless the duckbilled dinosaur was a zombie, the Tyrannosaurus rex that attacked it was certainly not a scavenger! See Publications for full article. Bird tracks are very rare in the fossil record because they are formed in areas that are prone to erosion and obliteration by water or wind. Until Robert recovered two bird tracks from the Hell Creek site, no bird tracks were ever reported from the Hell Creek Formation. The birds that formed them lived alongside the dinosaurs of the Late Cretaceous. 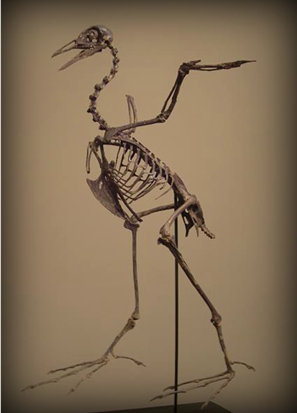 The Hell Creek Expeditions have uncovered a specific bony growth associated with pregnant birds and dinosaurs. This bony growth, called medullary bone, only occurs at the time a bird or dinosaur is pregnant, or immediately after the eggs are laid. The presence of medullary bone in at least three dinosaur taxa from our field station indicates that the dinosaurs died during breeding season. Aspects of dinosaur breeding behavior, nesting locations, and species interaction during breeding season are being investigated. Until the Palm Beach Museum team discovered insects in the South Dakota amber, scientists had no idea that Hell Creek amber contained insects. The amber insects Robert discovered are among the very first to be reported in Hell Creek amber, and the first Cretaceous amber insects ever discovered in the state of South Dakota. See publications for article. The faunal groups of the Hell Creek Formation were once thought to be homogenous, roughly the same throughout the entire formation. 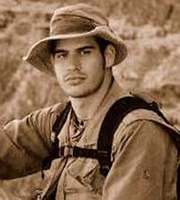 Current research, especially as a result of Palm Beach Museum expeditions, is indicating that the Hell Creek ecology was complex and comprised of localized groups of distinct species composition.